A very special tennis tournament was served up last Saturday afternoon – a diplomatic tennis match with three representatives from the different consulates in Chiang Mai, together with Governor Suwat Tantipat, in a ‘ferocious’ doubles competition, all in the name of a good cause. 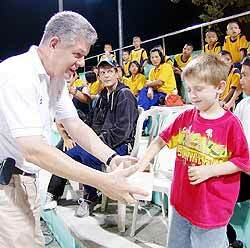 US Consulate representative Tom Le Doux serving, while Chiang Mai’s Governor Suwat prepares himself for the return. That cause was ‘Tennis is my dream’, a project helping underprivileged children acquire healthy recreational skills and habits, which has been the beneficiary of donations from groups and individuals both in Thailand and abroad. Recently, 14 girls from Viengping Children’s Home and six boys from Baan Dek Chai were the lucky recipients of 20 hours of tennis instruction at the 700 Year Anniversary Complex. While greatly appreciated by the children, who had all levels of skill, all this has to be paid for and even with sponsorship from individuals, a mixed tennis clinic costs 4000 baht for 20 hours, not counting the voluntary work of coaches, trainers, and people who have fun in sharing their tennis expertise with underprivileged children. German Hon. Consul Hagen Dirksen teamed up with the Japanese Consul General Katsuhiro Shinohara. 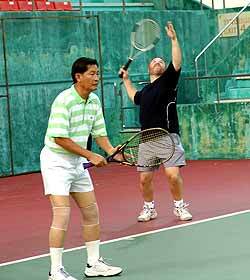 The diplomatic tennis tournament aimed to raise funds by charging entrance fees of 100 baht per person offering tennis, some fun and good company. 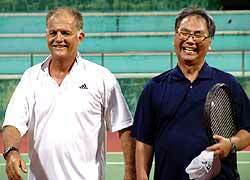 Players included Chiang Mai Governor Suwat Tantipat, Consul General of Japan, Katsuhiro Shinohara; Honorary Consul of Germany, Hagen Dirksen, and Tom LeDoux as the American Consulate representative. Former Davis Cup player Suparat Chookuan with a powerful serve. Governor Suwat and Tom LeDoux had an incredible run, with big serves by the governor but Hagen Dirksen could return just as hard. Shinohara-san showed expertise on the highflying balls that were sometimes quite unexpected. Despite the on-court action, the most dangerous position was that of Umpire whose rather unexpected decisions were immediately overruled by the players and the spectators. Enjoyable for everybody, and it ended almost too soon. Hagen Dirksen returning, while Katsuhiro Shinohara seems to be very impressed. After the not-so-serious matches, there were some tennis coaching demonstrations and a junior singles match between Aom (16) and her friend ‘Nok’ the 12 year old northern champion in the Under 16 age group who has been trained for five years by a foreign resident who saw her potential when she was very young. Nok is now in Bangkok to represent Chiang Mai in the Junior Masters tournament. 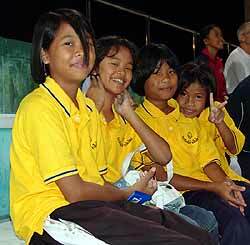 The little helpers from Baan Dek Chai also enjoyed the great tennis matches. 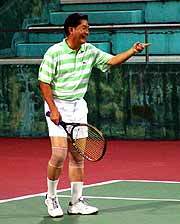 Another attraction was a men’s doubles match between Suparat Chookuan, a former member of the Thai Davis Cup and Khun Tara against Khun Udomsak and Khun Piroon. 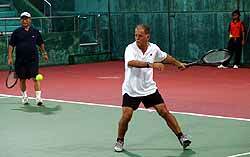 The gate takings all will help the ‘Tennis is my dream’ project run more tennis clinics for orphans and needy children. Children in institutions have their basic needs for shelter, food, and state-mandated education met, but they have few opportunities for sports or other life-enriching experiences. Tournament director Frank Weicks (left) received a little help from four year old Sam during the lucky draws. Gotcha! Governor Suwat made a point, and nobody argued. 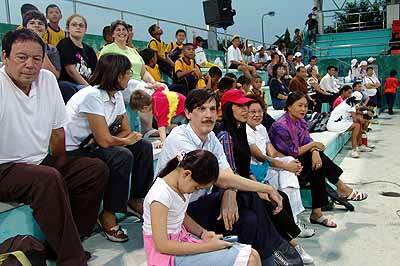 The audience was fascinated by skills of the players. The organizers and participants of the fun event. A big thanks went out to all VIPs, organizers, and ball girls. In Chiang Mai, there are a number of Hindu communities and temples to mark the existence of this group of religious people in our midst. 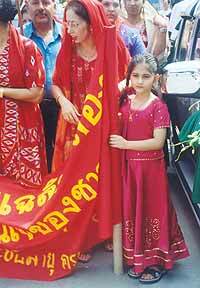 A few weeks ago, the Thai-Hindu Association of Chiang Mai along with Thepmontien Temple held the Navaratri (Dussera) festival in Chiang Mai to recall the victory of the goddess Uma Devi, the widely accepted goddess of many Hindu worshippers. Decorating the Buddha image before it is carried through the city. 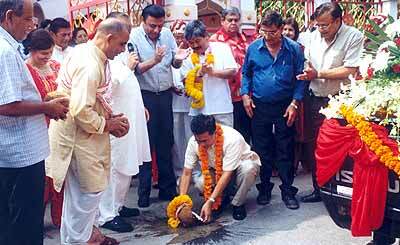 The festival is universal, but can be celebrated in many different ways in the different regions of India. Navaratri is derived from the words in Hindi meaning ‘nine nights’ and the festival lasts that length of time, with the tenth day being the Dussera festival. 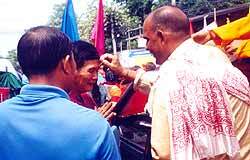 Marking the red spot on the forehead as part of the Hindu belief. In Chiang Mai, the religious celebration is not only performed to commemorate the goddess Uma Devi but it is also to give great merit to honor Her Majesty the Queen’s 6th cycle birthday to show the strong Thai-Hindu community spirit. A little girl dressed in traditional clothes. The festivals are steeped in antiquity and relate to many gods and goddesses known to Thai people, even through the Ramakien, such as Vishnu, Ram and Shiva; however, Navaratri is dedicated to the Mother-Goddess known variously as Uma Devi, Durga, Kali, Bhavani, Amba, Chandika and more. Western India (Gujarat and Rajasthan) celebrates for the entire nine days; both men and women participate in a dance in which they go in circles around an object of worship. The dances start after 10 p.m. and many a times they continue up to the small hours of the morning. In eastern India (especially in Bengal) this festival is the principal festival and is celebrated with gaiety and devotion through public ceremonies (Sarvajanik of Sarbojanin Durga Puja). 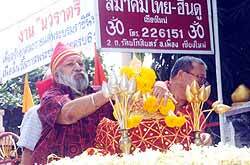 Chiang Mai Mayor Boonlert Buranupakorn split the coconut as part of the Hindu ceremony. On the tenth day (Dassera) giant effigies of Ravana, Kumbhakarna and Meghnad (Lord Rama’s enemies) are publicly burnt, but despite the various ways in which this festival is celebrated the feature that is common is that of the worship of the Mother Goddess Uma Devi who spent nine days and nine nights to destroy all devils. 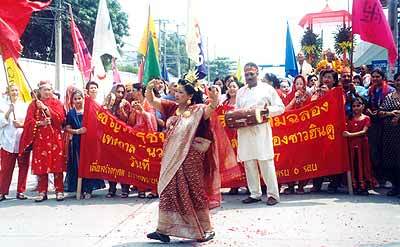 Boonlert Buranupakorn, Chiang Mai mayor, joined the parade on October 14 as a representative of Chiang Mai’s Buddhists. One way that Hindu people express loyalty and make merit to the goddess is by following strict vegetarian rules during the Navaratri period. This year, the Navaratri festival began October 14. On the first day Hindu people in Chiang Mai gathered to parade around the city and invite everyone to celebrate the festival with them. 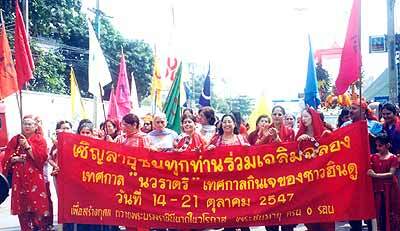 The procession started from in front of Wat Thepmontien (in front of the Chiang Mai Municipal Stadium) and moved around the city. A beautifully dressed woman dancing in front of the procession. Through this celebration by the Hindu community we can see that it is not just a pure Hindu ceremony but also reflects some Thai beliefs as well. This could be seen by the Buddha image being carried along with the procession. Hindu descendents gather to celebrate the festival. 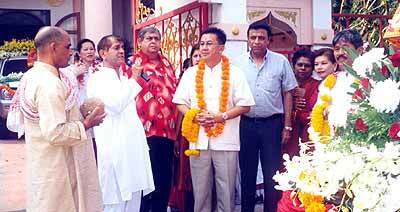 Thailand prides itself on being a land of peace, practicing religious tolerance. We must all strive to live together harmoniously.